It sings. It dances. It tells jokes. It can even shake a person’s hand and perform certain kung-fu moves. 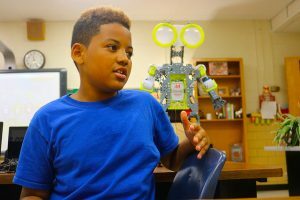 It’s an operational robot known as Tobor—fully constructed, coded, and programmed by a DeKalb County School District (DCSD) fourth grade student Braylen Mack. Mack, a student at Allgood Elementary, constructed Tobor in his spare time after seeing a friend with an affordable robot set. Inspired by his Instructional Technology class and teacher Riema Cummings, Tobor’s story illustrates how science, technology, engineering, and mathematics (STEM) play an important role in inspiring students’ imagination. Mack originally desired to build Tobor after seeing a friend with robot materials from the brand Meccano. 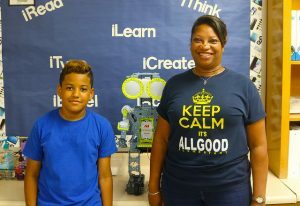 Meccano is a model construction company based in France that offers affordable robot sets to students and enthusiasts. Mack has programmed Tobor to dance, do kung-fu, yoga, tell time, tell jokes, shake hands, and more based on voice commands. It also lights up in a variety of colors, including neon green, purple, red, and blue. Building Tobor provided Mack with hours of escape. Today, Tobor is still providing Mack with endless entertainment. Mack has always been the type of student to express himself through technology, according to Cummings. Whether it’s through programming, building or troubleshooting, he has always had a knack for machinery. Cummings said Mack recognizes the relevance of her Instructional Technology class, which is rare among students in his age group. 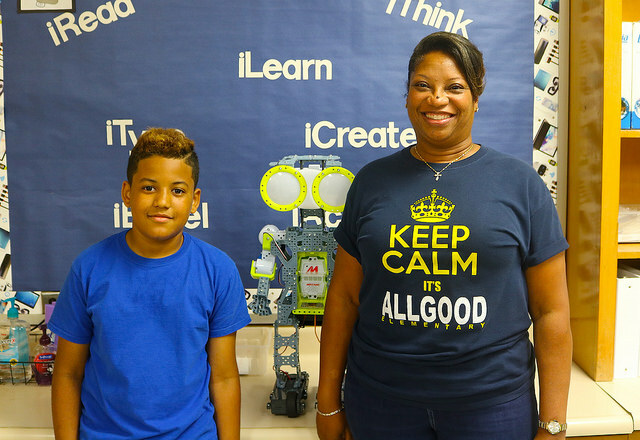 She said programs like Allgood Elementary’s Instructional Technology curriculum allow students like Mack to not only gain interest in relevant STEM skills, but flourish. Cummings did not initially believe Mack when he told her he built a robot. It wasn’t until the next day, when he showed up with Tobor, that Cummings fully recognized Mack’s affinity for technology. Mack said Cummings’ class has taught him how to code, type, and have fun while learning. Viewing online videos of other creations—a LEGO vending machine, arcade machine and, human-sized LEGO car—showed Mack what was possible when combining such a passion with spare time, practice, and determination. When he’s not at school, he spends a lot of his time researching new ways to build new machines. Mack said he is perpetually inspired by such fictional robots as Tobor from the film Shark Boy & Lava Girl—where Mack’s robot received his name—as well as the titular character from the film Chappie. “You can build a robot. You can program it to act like a human. That robot can then be your friend,” Mack said. Mack hopes to design machines for the United States military when he grows up. He cites the potential pay, combined with his joy for building, as the main motivation for entering such a career. Until then, Mack plans to collect other robots, including Meccano’s child-size model. 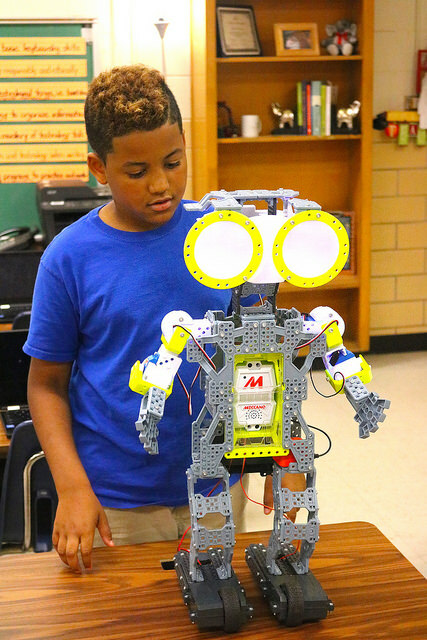 “It moves, you can program it to do stuff, and it’s life-size!” Mack said.